Below you fill find all funeral homes and cemeteries in or near Mooresville. 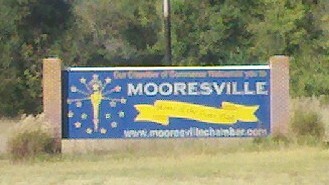 Mooresville is also known as: Morgan County / Mooresville town. Zip codes in the city: 46158. Some of the notable people born here have been: (amos rusie), (nan whaley), and (william g. bray). Mooresville is a town in Brown Township, Morgan County, Indiana, United States. As of the 2010 census, the town population was 9,326. It was written on September 17th, 2015 that John T Tracey passed away in Mooresville, Indiana. Tracey was 47 years old and was born in Holland, MI. Send flowers to express your sympathy and honor John T's life. It was written by Arizona Republic on August 6th, 2015 that Sidney N Jr "Sid" Chandler died in Show Low, Arizona. Chandler was 67 years old and was born in Mooresville, IN. Send flowers to express your sorrow and honor Sidney N Jr "Sid"'s life. It was reported by Johnstown Tribune-Democrat on December 31st, 2014 that Stanley G Dr Long passed on in Westmont Johnstown, Pennsylvania. Long was 83 years old and was born in Mooresville, IN. Send flowers to express your sorrow and honor Stanley G Dr's life. It was disclosed on July 27th, 2014 that J Terrie Maddox perished in Mooresville, Indiana. Maddox was 81 years old. Send flowers to share your condolences and honor J Terrie's life. It was written on July 26th, 2014 that J Terrie Maddox perished in Mooresville, Indiana. Maddox was 81 years old. Send flowers to share your condolences and honor J Terrie's life. It was noted on June 12th, 2014 that Carol J Rea (Rogers) passed on in Mooresville, Indiana. Ms. Rea was 59 years old and was born in Peoria, IL. Send flowers to express your sympathy and honor Carol J's life. It was written on June 11th, 2014 that Carol J Rea (Rogers) died in Mooresville, Indiana. Ms. Rea was 59 years old and was born in Peoria, IL. Send flowers to share your condolences and honor Carol J's life. It was revealed on July 29th, 2012 that Kevin L Carter perished in Mooresville, Indiana. Carter was 52 years old and was born in East Peoria, IL. Send flowers to share your condolences and honor Kevin L's life. It was written by Coloradoan on December 3rd, 2011 that Jeanette Groves (Fleener) perished in Fort Collins, Colorado. Ms. Groves was 91 years old and was born in Mooresville, IN. Send flowers to share your condolences and honor Jeanette's life. It was reported by Peoria Journal Star on July 10th, 2011 that Nadine Ann Stewart (Hobdy) perished in East Peoria, Illinois. Ms. Stewart was 80 years old and was born in Mooresville, IN. Send flowers to express your sorrow and honor Nadine Ann's life. Mooresville is a town in Brown Township, Morgan County, Indiana Township, Morgan County, Indiana County, Indiana, in the United States. As of the United States Census, 2000 census, the town population was 9,273. It was founded in 1824 by Samuel Moore, a Quaker from North Carolina. . . The official website for the city of Mooresville is http://www.precisionds.com/PageNotFound/tabid/62/Default.aspx. WEISENT , Ruben C., 81, of North Canton; call 90 minutes before service 11 a.m. Friday at Rossi in Canton. WOOD , Dempsey C., 48, of Mooresville, N.C.; call 6:30 to 8:30 tonight at Cavin-Cook Funeral Home; service noon Thursday. Listing all funeral homes in Mooresville, Indiana so you can easily send flowers to any location (same day delivery) or find any funeral service. Find a Funeral Home inMooresville, Indiana IN to provide the caring burial and ceremonial services your family deserves. Listing all funeral homes in Mooresville, North Carolina so you can easily send flowers to any location (same day delivery) or find any funeral service. We work with local florists and flower shops to offer same day delivery. You will find budget sympathy flowers in Mooresville here. Our funeral flowers are cheap in price but not in value.